The Runner can spend click to break any subroutine on Zed 1.0.
subroutine If the Runner has spent at least 1click to break a subroutine during this run, do 1 brain damage. This might be the least used card in the whole history of Netrunner. It has nearly every disadvantage it could have: low strength, typical click-to-break quirk every bioroid shares, a pair of subroutines that require a proper setup in order to fire. And yet, this might be the card with the most unsettling, the most terrifying flavor that ever was printed. Which, in turn, makes it one of my absolute favourites. As we all know, every bioroid has a distinct personality, a result of a process called "brain taping". Brain taping involves "recording" a personality of a human - modelling a functioning cybernetic brain using an actual brain as a template. Such is a costly and lengthty process - to the point where the number of bioroid "types" is very much limited. In order to ever pass the concept phase, creating a new bioroid line has to be, above all things, profitable. Every bioroid has something of a theme for their personality. For instance, Rex is heroic, Eve is seductive, Alix is brilliant yet fragile. Then there is Zed. Have a quick look at the flavor text. The main quirk of Zeds everywhere appears to be curiosity. Curiosity of a very particular kind. Clearly, the Zed line has been modelled after a guy who also was curious, in a way that led him to cutting up stray puppies just for the thrill of discovery. A dangerous, violent yet meticulous psychopath, possibly a serial killer. Then there was somebody at Haas-Bioroid who decided that investing millions of credits into developing a product line based on such a person was a good idea. Why would that be? Right, this is ICE, so network security would be an obvious answer, but that feels just like going a really long way to accomplish something that could have been done with much less hassle and much less risk. Just doesn't add up. With that in mind, is anyone ever surprised that the events of Terminal Directive happened? What's gonna be next, Bateman 1.0? The new Zed directs its morbid thirst of discovery towards personas met in the network. The bioroid finds it extremely fascinating that a personality, a consciousness can be stored in something that isn't a machine. It doesn't worry much with the notion of pain and suffering - bioroids do not know any of these things - and at a nearest convenience proceeds to analyze it with the tools provided: a gruesome mask and a set of scythe-like fingers. A human might associate them with known popculture tropes - to bioroid these pose no meaning. Zeds are clueless murder machines, which makes it extra creepy. Zed is able to reach out to you if you happened to break a subroutine with a click. Which means, you looked inside a bioroid's skull and maybe found a way to rewire it so that it didn't hurt you. Maybe you connected to it so you could chat with it for a while and explain why it really should let you pass. Doesn't matter - now the same connection you've made allows the bioroid to look inside you. Basically, Zed does to you what you did to his kin. How sick is that? How is that thing not illicit?! As an added bonus, there is a little combo I've found. Zed 1.0 all by itself is perfectly harmless - it requires an another bioroid in front of it (or really any ICE under some circumstances), and this assuming that the intruder decides to use up all the clicks on it and yet keep moving on. What to do? The answer: Sub Boost it. The other player smirks at you - "I'll click that ETR, then". And then - what's that? - the other two subroutines fire! Project Wotan can be used in the same manner. Now you force the runner to click not once, but thrice, turning Zed 1.0 into a cheaper alternative for Turing - sadly, without the AI hate, but still. ...and get Ryon Knighted. You had him stashed in the contested server, right? Probably the single least popular Bioroid with the possible exception of Sherlock 1.0, despite having some of the most awesome creepy artwork of any Netrunner card. 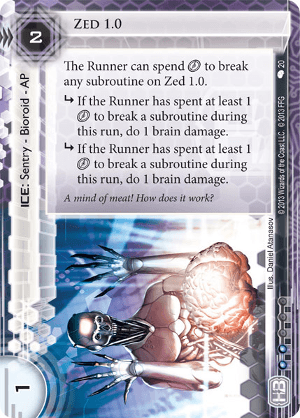 Let's consider the cons first: Zed is weak, can be clicked through, and his subs are conditional: he needs to be placed behind other bioroids to have any effect at all, and even then the runner needs to have clicked through a sub rather than breaking it with money. But the pros: at 2 credits he's cheap for an ice with 2 subs; and incredibly cheap for one that can threaten 2 brain damage. He rounds out Eli 1.0 and Viktor 1.0 as the sentry of HB's suite of low-cost, 2-sub ICE, and actually complements them pretty well when he's in position. In the right spot he can at least force the runner to go get their breakers instead of cheerfully clicking into your servers, and in very rare situations, he's a brain damage or 2 for a couple of credits. Zed is an awkward card, but definitely not a terrible one. In Cybernetics Division: Humanity Upgraded, landing an early brain damage has never been more important, and Zed could prove to be a nasty surprise, especially with support from the likes of The Twins, Ryon Knight, Corporate Troubleshooter and now Marcus Batty.